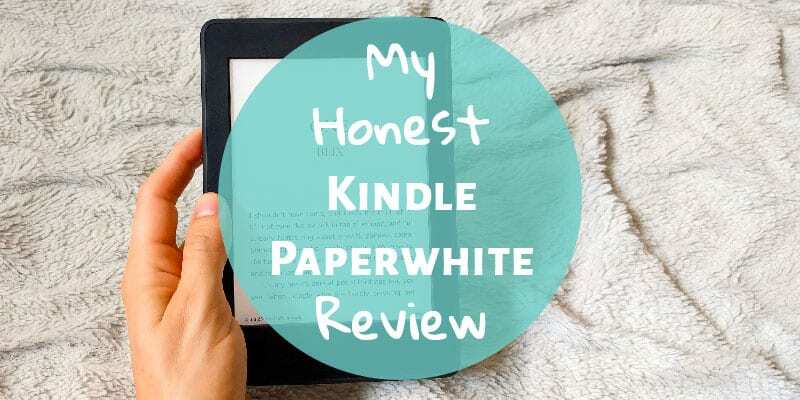 So I thought it was time to do a full review of the Kindle Paperwhite. It is my second e-reader and there is a whole lot that I love about it, including the fact that it saves me a ton of money. More on that in a minute! 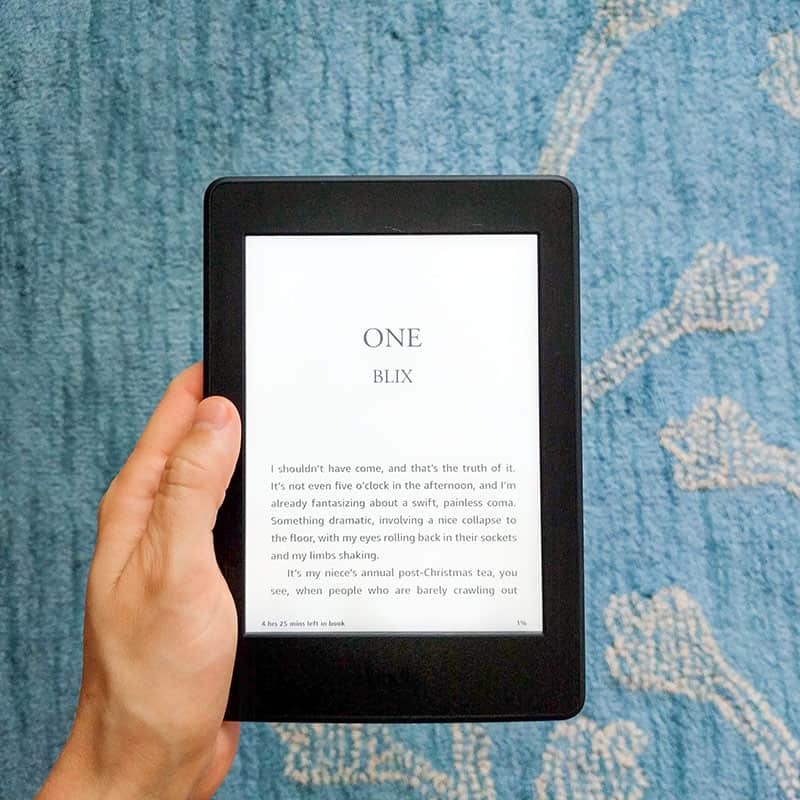 It can be a little confusing to compare the different kinds of kindle e-readers, so let’s look at the main differences between versions. This is the most basic version. Like all of the rest, it has a glare-free screen, connects to wifi, and has a battery that lasts for weeks. The screen resolution isn’t quite as good as the other versions. Without the built-in light that the other versions have, it’s like reading a normal book and you’ll need to be near a lamp to read in the dark. It has no screen light-source of its own. This is the one I have and love. The big upgrade from the basic Kindle is the built-in light, which was the selling point for me. Instead of being backlit, like your phone or tablet, the light shines onto the “page” so that your eyes don’t get tired like they can with a phone. You can adjust the screen brightness manually. This is the fancy version. The big upgrades are that it’s waterproof (crazy!) and the built-in light adjusts itself automatically, so the screen gets brighter or dimmer depending on where you’re reading. My choice is definitely the Paperwhite for the features and affordibility. The oasis costs a lot more money and I don’t value the features it would give me enough to make the extra cost worth it. I suppose if you often read in the bathtub or at the pool, the waterproof feature would be helpful. It’s not difficult at all to manually adjust the screen light, so that doesn’t tempt me either. In fact, my iPad adjusts brightness automatically and I often find myself manually readjusting it anyway, so I think I’d find that feature annoying. When you buy, you’ll get a few options. Color Choices: Black or white. Special Offers: You can pay more to remove special offers. Special offers means that every time you turn off the Kindle, the sleep screen shows you an ad for an ebook. I didn’t upgrade to get mine without special offers and it doesn’t bother me. It’s easy enough to ignore the ads on the sleep screen. Connectivity: You can pay extra for cellular connectivity, so that you can download new books or reading material any time. If you don’t upgrade, you can only do this if you’re connected to wifi. This is a very expensive upgrade and totally unnecessary in my opinion. Most of the time I have access to wifi and can download whatever books I want. If we’re going to be traveling, I make sure to download multiple books before we go just in case I don’t have wifi access when it’s time to start a new book. No big deal. 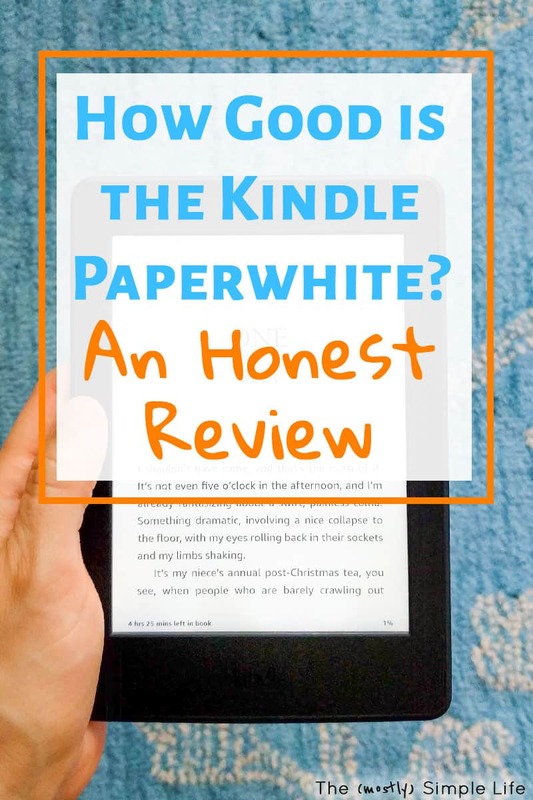 I had the original Kindle when it first came out and the reason I eventually upgraded to the Paperwhite was the built-in light! You know how your eyes can get tried and strained and start to sting if you’re looking at a screen for a long time? That’s because computer, tablet, and phone screens are backlit. You’re basically looking into a light the whole time. The Kindle Paperwhite’s light is special. It shines onto the “page” instead of up at your eyes. This means you can read for hours without your eyes getting tired. It also means that you don’t need to be near a lamp to read in the dark like you would with a normal book. I can read in bed without any other lights on while my husband sleeps, which is handy. You can manually adjust the screen brightness to make it easier on the eyes. I now find myself preferring to read on the Paperwhite instead of a normal book! It is so much more comfortable to hold because I can hold it in one hand and I’m not trying to keep the pages open. It’s nice and light too. If you are a quote-lover, this is a great feature. You can highlight sentences or passages anywhere in a book. Then, you can easily find those passages again from the menu or you can have the Kindle email you all of the highlights you made in a book! I love this because I usually read library books and this sends my favorite quotes to me so that I can save them long after I’ve had to send the library book back. You can easily adjust the font or text size on any ebook, which is wonderful if you need to read large print books. The battery definitely lasts weeks, as advertised. I have to charge the Kindle so little that I’m usually surprised when it pops up and says low battery. This is super nice if you’re traveling or out for the day. You don’t need to worry about remembering a charger everywhere you go. Yes! 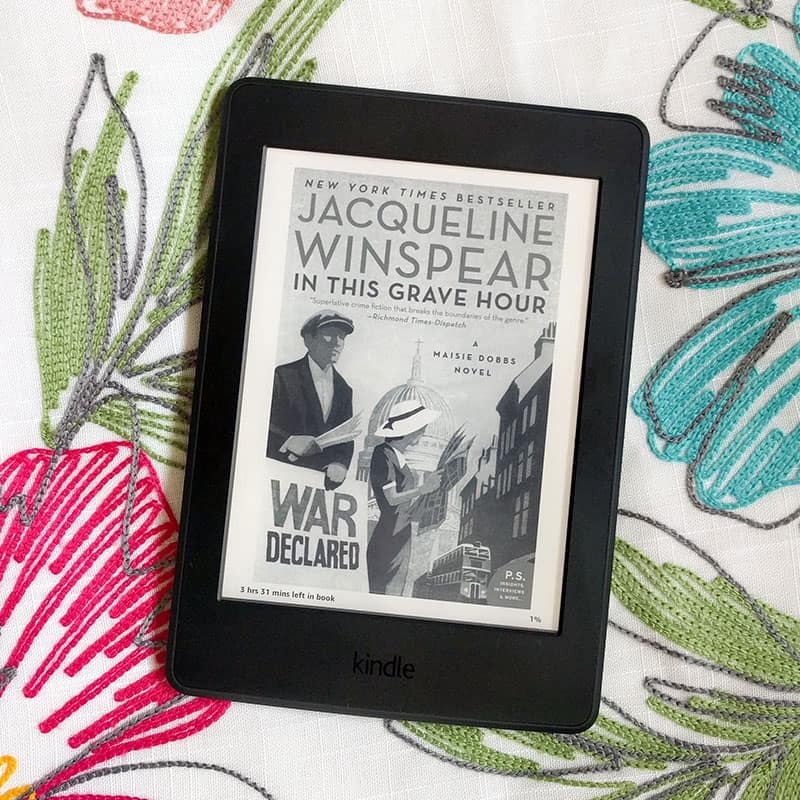 The Kindle Paperwhite makes reading free or super inexpensive! I almost exclusively check out library ebooks to read on my Kindle. I do this through the app the library gives me access to (Overdrive or Libby). The books get electronically sent to the Kindle when I have wifi. What’s great is that it is impossible to get late fees. You don’t have to worry about returning the book. Once the book is due, you can no longer access it on your Kindle and it is automatically “returned” to the library. If you can’t get the library ebook you want, in general, ebooks are much less expensive that physical copies of books. So if you need to purchase, you’ll still be saving money. Amazon says that they have over one million books for $2.99 or less, plus over two million books that are under $9.99. Who Is the Kindle Paperwhite For? Readers! It does take a little adjustment if you’re used to reading physical books, but I prefer to read on my Kindle Paperwhite now because of the light and how comfortable it is to hold. Older Readers. I know that the selection of large print books at the library can be limited. The Kindle is very easy to use and since you can adjust the text size, you can make any book a large print book. Kids. I didn’t go into the kid-friendly features, but there are some great ones like a vocabulary builder and achievement badges. 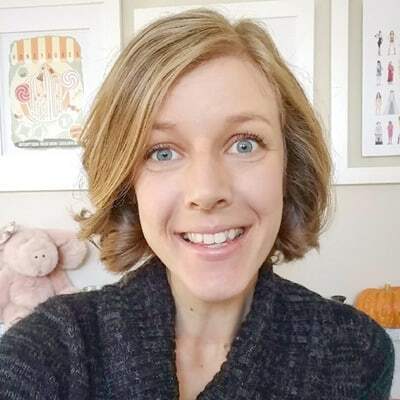 Plus, since most kids love screen time, they might feel like reading is more exciting on a Kindle device. Money Savers. I really do save a ton of money by checking ebooks out from the library onto my Kindle. It’s very rare that I have to pay for a book. Plus, I don’t have to find time to go to the library. Purchase a Kindle Paperwhite Here. This year I feel like I’ve rediscovered how much I enjoy reading! 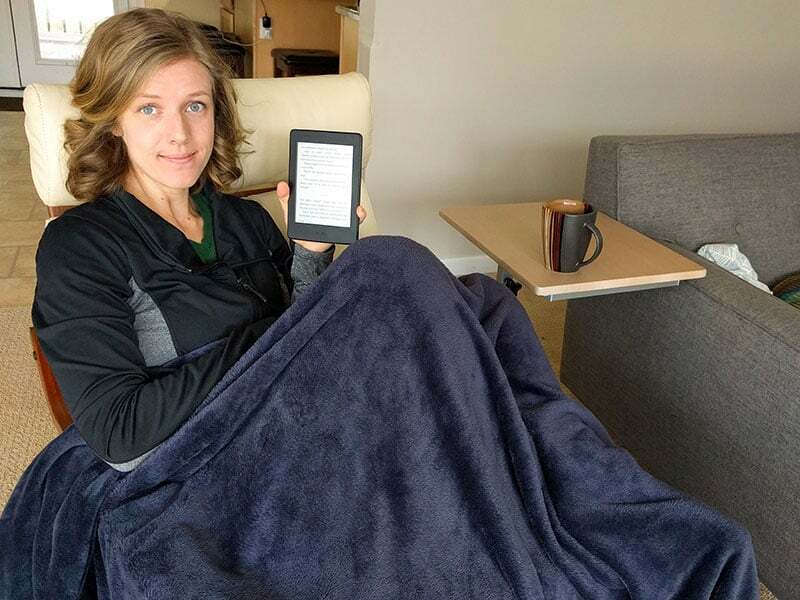 My Kindle Paperwhite has been a pretty big part of my reading experience, which sounds funny but is totally true. It’s easy on the eyes (hehe), isn’t fussy to hold, and allows me to read for free most of the time with rented ebooks from the library! Books I Finished in 2018: My Reading List! ⇒ Do you have an ereader? What do you like or dislike about it? I also have a Paperwhite, and love it for all the reasons you mentioned. A friend recommended bookbub.com, a site that allows you to select categories of books, and it sends you emails of books under $2.99 that you an download. If the library doesn’t have a book I want, I check here. And I have been introduced to new books and authors this way— I am willing to spend a couple of dollars to read a new author, because I feel I lose less money than buying a full price Kindle book! I have also come to love Libby, which my library also uses, for downloading books from the library. 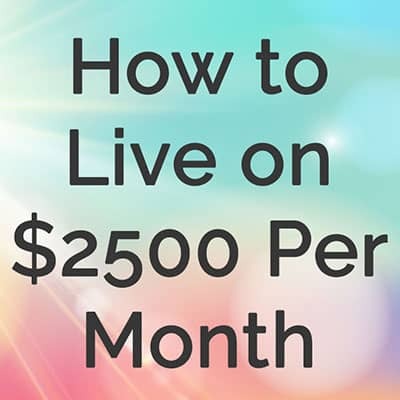 I have also tried Kindle Unlimited, which has you pay a set fee every month on Amazon to download a fixed number of books each month. Plus there is a benefit for Prime members, where you can download a free book every month. But by far I use the library the most. Our library also offers the ability to download over 200 magazines through the app RBDigital. 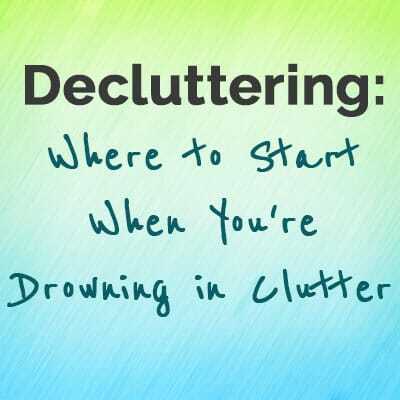 I save a ton of money every month doing this. I use my iPad for this, so I can see the photos in color. Thank you for commenting! I had not heard of bookbub.com. I will definitely check that out for the books my library doesn’t offer! We have very similar library services and that’s definitely what I use the most. I hardly ever pay for books!